I'm over being sick, hooray for that — and hurrah for your company and all of your magical home remedies. The combination made for fantastic one-two-punch to knock out that pesky cold. While I'm no longer under the weather, I am under the spell of a bout of nostalgia, just so you know. And, so you know, sometime tomorrow you'll be wanting to preheat your oven to 400°F. 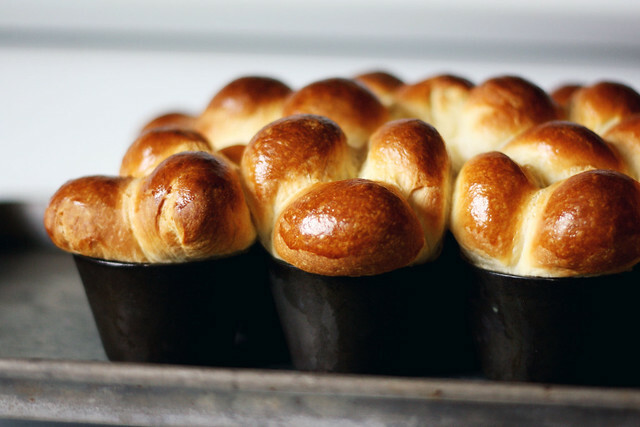 There's brioche to be baked. My husband Sean and I are coming up on an anniversary — not an "official" one exactly, and maybe not the most major in the grand scheme of things, as we've been together long enough that our calendar is peppered with small remembrances to mark our journey of getting here. It's not an event that warrants a fuss, really. We've both got milestone birthdays next month, so there'll be fuss to spare. He is seven days my senior, a fact that hasn't lost its charm to me in all this time of knowing him. There's a smile in the thought that on the day that his parents were celebrating his one-week-old-ness, my parents were celebrating my arrival. These small things, these scraps of our shared history wrapped up together, is what led to today's baking. You see, also tucked in that package of sentiment is the day in May, ages ago, when Sean asked me to live with him. With that question he was also asking me to move to another city. After years studying, then teaching, then working abroad, and across this country, he had returned to the city where he was born. A city he knew well, and was full to its borders with his stories, but one I'd only visited. I moved. And I fell for that city as I'd fallen for him. I got to know his friends and made them even more mine. Those guys have good, strong arms for lifting furniture up three flights of stairs, arms that are even better for opening wide in welcome of a newcomer into their Club of Locals. Together Sean and I discovered the places that had changed in his absence, and he introduced me to his old haunts that had stayed the same. One of those places was a particular deli. That deli, which is still there though we're not, has aisles of mustards and oils, along with a bakery and a meats counter, and one side where you can sit down to eat things like cabbage rolls and soup. Sean and his folks had gone there when he was a child, and I don't know if it was a habitual stop, but I do know it made quite an impression on his young senses. It was the place where he tried his first chocolate spiked with liqueur. He didn't like it much. What he did like was their egg bread. Their bread is actually made into buns, though not the ones we've got here. Theirs is most likely close to challah, though I've never asked. (I really should.) It's scattered with poppy seeds and is deeply yellow and sweet. When he and I would go, we would buy a bag of buns on every visit. They were our usual, back in a time when having a "usual" with someone else felt new and kind of exciting in a silly way. Today there's brioche on our counter and not challah — the Francophile version (read: stuffed with butter), if you will. It's probably excessive to be considered a usual. That said, it's exceptionally appropriate for a sort-of celebration. Brioche lives in between bread and pastry, which is a nice place to hang out. It has a proper crust like a bread, with a soft, almost cakey crumb that peels apart in lacy layers like the interior of a croissant. It is deceptively light, dangerously so, as it takes a pat of butter like nobody's business. 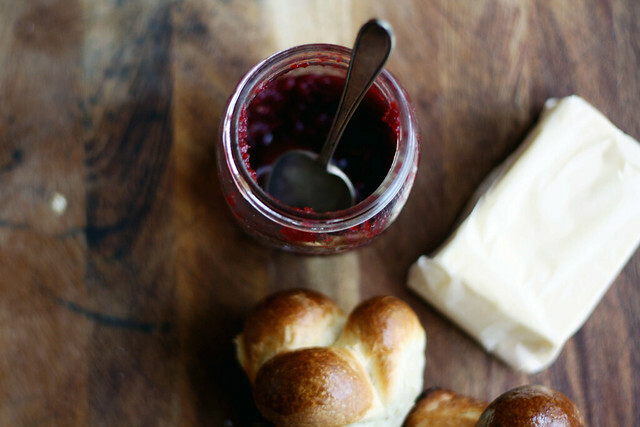 Top it with jam and, well then, you do things right. 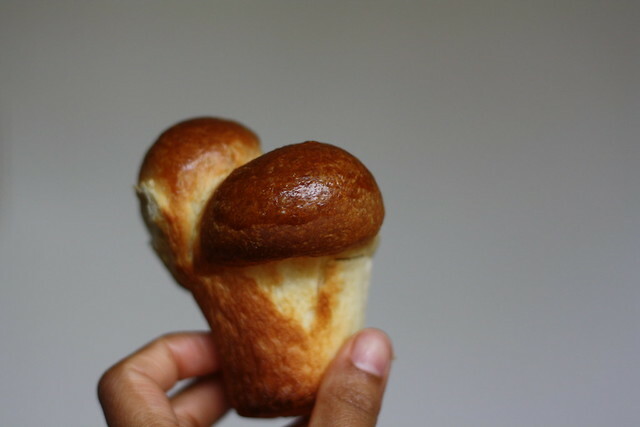 Brioche is yeasted, enriched with eggs, and is hardly a fuss either, though it requires an overnight rest. I prefer to look at that lull in activity as a boon, with the work spread out over two days. One evening, you bring together this smooth, rich dough that does in fact feel much like a baby's cheek — so much so that if you told me that brioche dough was the inspiration for the phrase "soft as a baby's bottom," I wouldn't be surprised. Then, tucked in the fridge, everyone's off to bed. I lost something recently; small enough that I didn't notice its absence until yesterday — and then I spent the following hours upturning every drawer I could find, turning out every pocket I came across. It distracted me. I kept looking for it in corners and running to another end of the house, with a sudden inspiration of where it might be. I woke up this morning with what was lost tugging at the edge of my thoughts, like a loose thread caught on a splinter. But there was bread to be made, dough that had waited hours for my attention. With two small lads in my aid, we learned that silken dough is no match for hands skilled with Play-Doh, and made quick work rolling that dough into teeny rounds, which were then tucked snugly into a well-buttered pan. The buns rested, and brushed with beaten egg as a glaze. "Dab, dab, dab, paint, paint, paint" we said. Instructions work best in threes. Into the oven went our handiwork, and in 20 minutes the brioche rose and bloomed, like clovers. So on this Monday, as much as I'm annoyed with myself for what I've misplaced, the loss is that much easier to swallow with bread, butter, jam, made and shared with good company, in reminder of all that's been found. From Dorie Greenspan, as printed in Bon Appetit magazine, October 2009. This recipe was part of a brilliant article; it is full of charm, helpful anecdotes, and a goldmine of information when it comes to producing dependable results when baking this sublime bread. I highly recommend you give it a read.